1You cut the meat into small pieces and fry in hot fat. 2When they are golden brown, add salt, pepper, laurel with onion and chopped pepper. 3Then the tomato, water and dry wine. 4Let these uncovered until the meat is almost tender. 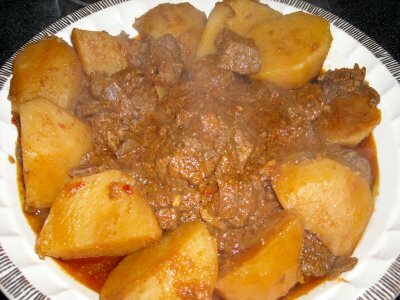 5Place the diced potatoes to the meat and cook cooked.